Undoubtly, Billy Lee Riley was one of Sun's most colourful artists and a legend since the Rockabilly Revival of the 1970s. Playing everything between Country and Blues, Rock'n'Roll and Pop, his 1997 album "Hot Damn!" was even nominated for the Grammy award. Though today's featured song is probably not as sophisticated as this LP, "No Name Girl" is nevertheless a much more elaborated approach than his early raw Rockabilly sides for Sun. Blues is the music I grew up hearing on the plantation. There were black and white families all living together. We were poor, and playing music was our main form of entertainment. After leaving the Army in 1953, he first moved to Jonesboro, where he played in C.D. Tennyson's Happy Valley Boys, before moving across the border to Memphis, Tennessee, in 1955. He got to know Jack Clement and soon joined Slim Wallace's Dixie Ramblers band. Playing bars and clubs at night, Wallace founded his own record label in 1956, named Fernwood Records. Riley was the first to record for this label but after a demo session, Clement took him to Sun and owner Sam Phillips signed Riley instantly to his label. The first session took place in early 1956 at WMPS studio in Memphis and produced the classic but back then unsuccessful "Rock with Me Baby" b/w "Trouble Bound." 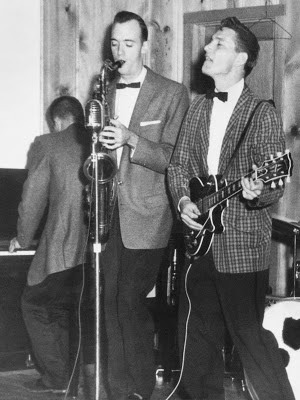 This recording also introduced guitarist Roland Janes and drummer Jimmy Van Eaton to Sun, who became the backbone of Sun's house band. During the next two years, Riley recorded numerous sessions that produced wild and raw Rockabilly classics such as "Flying Saucer Rock'n'Roll," "Pearly Lee," "Red Hot" and many others. Unfortunately, Sam Phillips focused on other artists like Jerry Lee Lewis. This led to the tragic decision to push Lewis' "Whole Lotta Shakin' Goin' On" instead of Riley's "Red Hot," which just had begun to do well in the south. 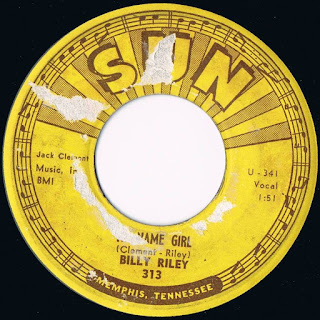 Today's selection, "No Name Girl," was recorded around December 1958 at the Sun Studio with Riley on vocals and guitar, Martin Willis on sax, either Charlie Rich or Jimmy Wilson on piano, Pat O'Neill on bass, and Jimmy Van Eaton on drums. On that same day, Riley also recorded Rock'n'Roll versions of two old standards, "Down by the Riverside" and "Swanee River Rock." Released on Sun 313 in early 1959 with "Down by the Riverside" on the flip, the record only stimulated low sales. Billboard, however, gave a promising review on February 9, 1959. It was even "A Billboard Pick" of the week. Due to low sales and Riley's frustration with Sun, he left and began producing his own records on an independent base. During the early 1960s several discs by him appeared on small labels, none of which caught on. He eventually became a session musician while living in California, before returning to the south in 1966. He kept on performing and recording and was "discovered" by a younger audience in the 1970s. Since then, he recorded albums and performed regularly in Europe. Riley died in 2009. Read about Riley's first single after his depature from Sun: The Spitfires on Jaro Int. Awesome collection of professional musicians, but for musicians on a cheap budget we’ve got an events theme for you called Working Musician.